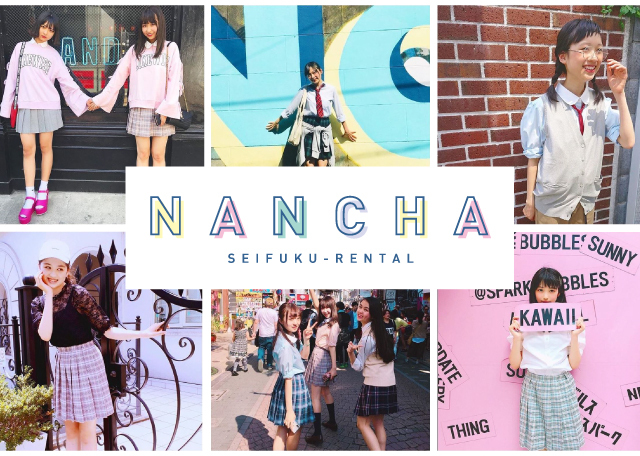 制服レンタルサービス「ＮＡＮＣＨＡ」What is "Uniform rental service" NANCHA "
NANCHA is a school uniform rental service that you can easily experience wear school uniforms from 1500 yen. KANKO SHOP Harajuku Select Square provide this service a directly managed store of KANKO GAKUSEIFUKU CO.,LTD. You just choose the school uniform from shop like ordinary shopping. The staffs will coordinate according to your wishes. It is easy to use without cleaning after using. You can also return by mail. You can purchase new items at discount price.Of course you can also enjoy rental only. This is new way for shopping. If you don’t want to fail, NANCHA is the best. You can buy favorite one after wearing it for a day. You and your friends can go to photogenic spot in Harajuku with matching school uniforms. You can go amusement park, ceremonial occasion. After wearing, you can return school uniforms by mail. · Shipping fee for returning by mail will be paid by the customer. · You need pay the arrears 20% of rental fee per day, until you return the school uniforms. You can wear school uniforms from only one item. And you can use this system from 1500 yen. You can choose school uniforms from various brands like earth music&ecology KANKO Label and more. You can return school uniforms without cleaning and you don’t need to visit store to return. You can return them by mail. If you like the school uniforms, you can buy the same new one a discounted price. Q. If school uniforms get soiled, do I need to buy it? A. If it can remove by washing, you don’t need to buy it. But you make huge damage or stain and loss them, you need to pay repair cost or purchase price for items. Q. Do I need a reservation? A. Sometime, we take the time to serve, but we serve our customers on a first-come, first-served basis. Q. Is there a large size? A. Some items are available. For details, please contact KANKO SHOP Harajuku Select Square. Q. Do you have a sailor suit? Q. Do you handle Men’s? © 2018 KANKO GAKUSEIFUKU CO., LTD. ALL RIGHTS RESERVED.